The Bourne Rivulet is an iconic fly-fishing tributary of the river Test immortalised by the trout fishing Opera singer Harry Plunket Greene in his book ‘Where the bright waters meet’. 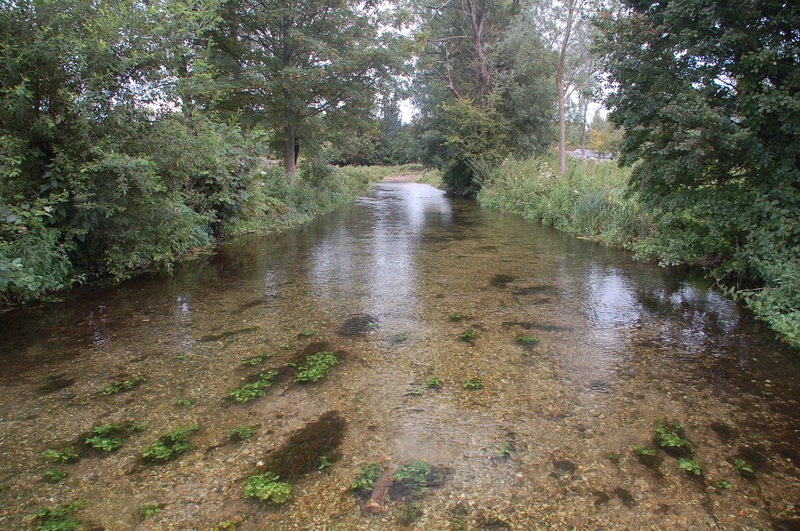 Upstream view to the parallel 9 months after restoration. Like many of the UK’s world-famous chalk streams, the Bourne Rivulet suffered state-sponsored, river engineering works in the name of ‘Land Drainage Improvements’ following WWII. 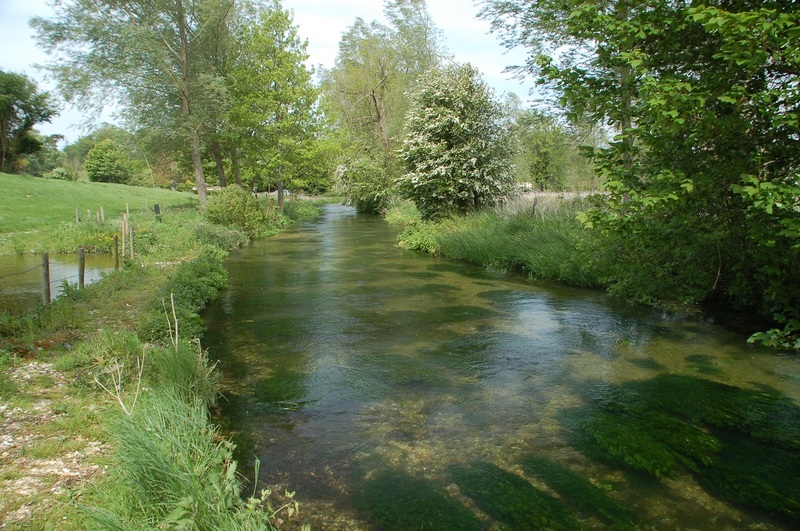 River channels were mechanically dredged and straightened to facilitate arable cropping in low-lying, floated water meadow systems close to the river. 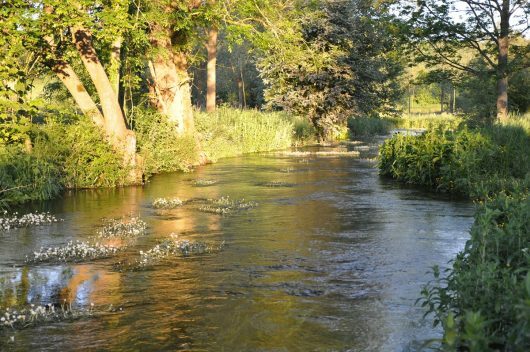 It is likely, as time went on, that an increasing proportion of these operations exceeded the original brief in that dredging operations became more random and sites more unsuitable as water authorities ‘cast around’ looking to ‘lose’ surplus budgets. 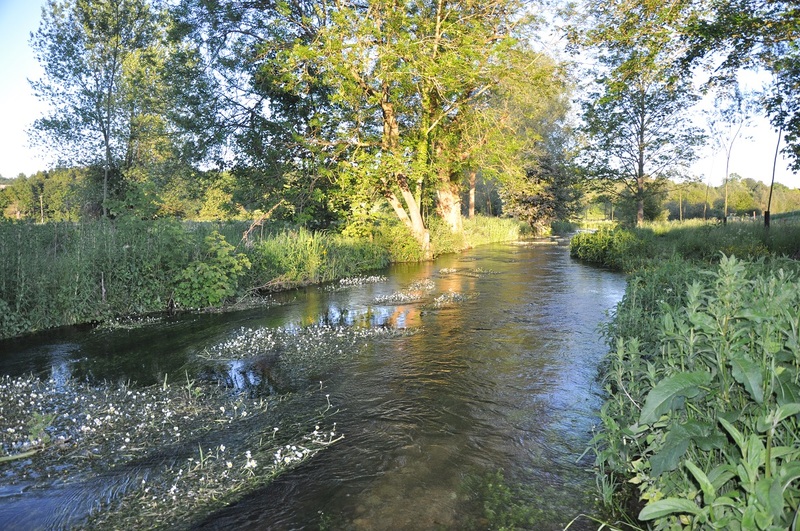 The Bourne Rivulet may have fallen into this category as any attempt to lower water tables has not improved the adjacent meadows to an extent that renders them fit for the plough. 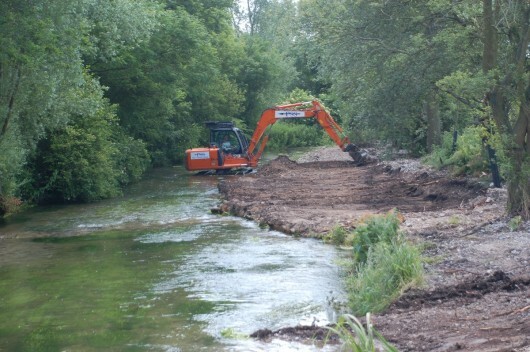 On inviting Simon Cain to comment on his ailing river habitat, the owner was intrigued to learn that channel engineering was the cause of habitat degradation….and that his perched and steep-sided fishing bank margins were almost wholly constructed from dredged river gravel deposits. Heb Leman of Environment Agency’s Romsey office inspecting a seam of pure river bed gravels on the perched True Right Hand bank of the rivulet. The client brief was to return the river to something approximating its pre-dredged status (Pools, riffles, meanders, shallow emergent bank margins etc) with a view to optimising the classic chalk stream habitat and world-class wild trout fishing associated with this headwater. The restoration scheme was designed and delivered by Simon Cain and the Cain Bio-engineering team on behalf of a collaborative partnership between the Riparian Land Owner & Natural England. During: Perched river banks, formed almost entirely from dredged river bed gravels, were pulled down and graded back into the river to form low-lying flood berms and meandering pool/riffle sequences. 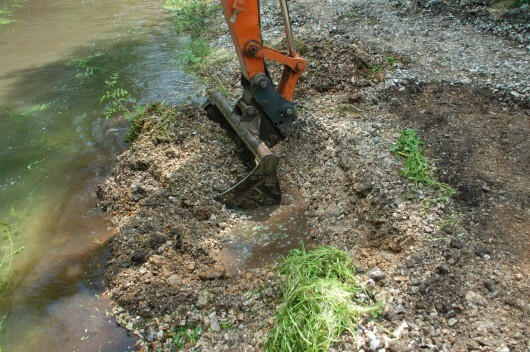 During: Detail of dredged river bed gravels being returned to the channel. Reach I – Before: Arrow straight, over-widened channel looking downstream from the ‘the parallel’, displaying classic symptoms of land drainage operations. Reach II – Before: Over-wide, straightened channel. Note steeply-sloping gravel bank left of shot. 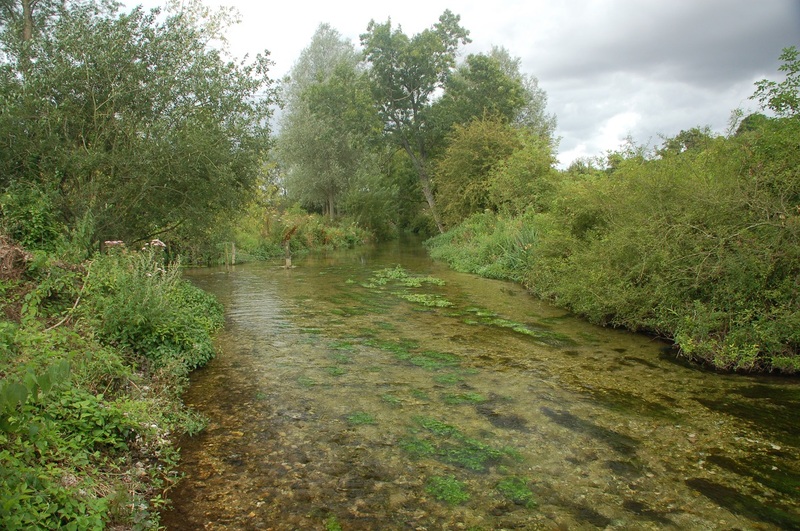 Reach II – After: Classic chalk stream habitat resulting from channel restoration works. 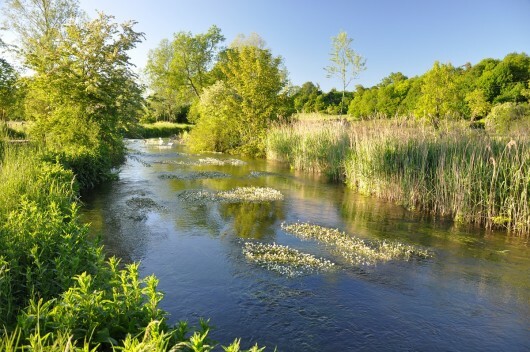 Clients: Private landowner/Natural England collaboration. Awards: Runner-up. 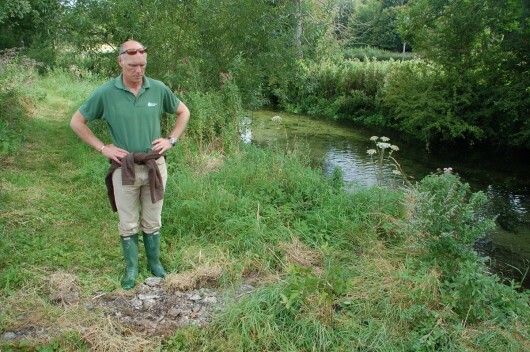 Wild Trout Trust Conservation award.